The sleek stylus that’s tucked away in your Samsung Galaxy Note 9 isn’t just for taking notes, you know. It actually serves many more unique purposes that you might not even know about. Most smartphones don’t come with the luxury of a stylus. Since your phone has one, you should take advantage of it every chance you get! Pop out your S Pen and start practicing—here are the S Pen tips that you absolutely need to know if you own a Note 9. Are you tired of awkwardly holding your phone when taking selfies? You follow all the tips to take a good selfie, but you still end up with a double chin. Little did you know that your S Pen makes snapping pictures a breeze. Take your S Pen out, and hold down the pen button. After a couple of seconds, your camera will open. When you’re ready to take a picture, just press the S Pen’s button again. Maybe you want to take pictures with the front camera instead. In that case, click the S Pen’s button two times, and the camera will switch from back to front. To take videos with your S Pen, you need to adjust your settings. Navigate to Settings > Advanced Features > S Pen > S Pen Remote > Camera. Under App Actions, you’ll see a section called Camera. This controls what action your S Pen performs when you click the Pen’s button once, and when you click it twice. If you want to start recording a video with one click (or two), select that option and pick Record video from the dropdown menu. In the same way that your S Pen functions as a remote for your camera, it works as a remote for other purposes as well. Don’t want to use your S Pen to take pictures? Choose another app to use with it instead. Your S Pen actually comes with Bluetooth inside, which means that it still works up to 30 feet away from your phone! In order to change your remote settings, go to Settings > Advanced Features > S Pen > S Pen Remote. Select the section Hold Down Pen Button To. A page will appear showing all of the apps you can open with your S Pen. The best apps to use with this feature are your internet browser, clock, or any of the S Pen features. Scroll down and you’ll see the different ways you can use your S Pen to browse the internet. By default, a single press brings you to the previous page, while pressing the button twice brings you one page ahead. You can choose to set it to scroll up and down the page as well. Don’t forget about the S Pen’s awesome integration with videos and music—click your pen button to pause or play your media. You can even use your S Pen to change slides during a professional PowerPoint presentation. Let’s say you’re giving a presentation with your S Pen and you need to unlock your phone from afar. Luckily, you don’t need to rush over to your phone to unlock it by hand. Simply click the S Pen’s button and your phone will unlock remotely. In order to activate this feature, head to Settings > Advanced Features > S Pen > Unlock with S Pen remote. You don’t have to open the Samsung Notes app to make a quick scribble. Whip out your S Pen and jot a note without unlocking your phone. The screen-off memo will automatically activate as you start writing. The pen icon on the top-left corner of your screen changes the thickness of your stroke, while the eraser option lets you wipe away any errors. To save your doodle, select Save in Notes or simply insert the pen back in its holster. You can find your note inside the Samsung Notes app. After a while, you’ll probably get bored of sending plain text messages. To show your friends something a little more fun, take out your S Pen to send them a Live Message. Under the Air Command menu, select Live message. On the bottom menu bar, you can change the color of your backsplash, insert a photo from your gallery, or add an AR Emoji. The two icons on the top-left corner change the thickness of your stroke, as well as the color of your pen. If you want to get really creative, you can add an effect. Choose from Ink, Glow, Sparkle, Hearts, Snowflake, and Rainbow. Each option adds a special touch to your message. When you’re done writing, you can view your message as a GIF, and send it to your friends. When you have a Galaxy Note 9, you don’t have to bother going back and forth between translation apps and your internet browser. Open up the Air Command menu by removing your S Pen, and selecting the Translate option. Hover your S Pen over a word, and you’ll get an instant translation in the language of your choice. Tapping on the translation will bring you to the Google Translate app for more detailed information. Have you ever used picture-in-picture mode on your TV? Well, Glance works the same way. You can open Glance through your Air Command menu, but it won’t appear by default. To add it to your Air Command menu, navigate to Settings > Advanced Features > S Pen and scroll down to to the Shortcuts section underneath Air Command. Click on it, and choose which apps you want to appear in the Air Command menu. Once you add Glance, you can use it to minimize your current app. The app will pop up in the bottom right-corner of your screen as a tiny moveable window. 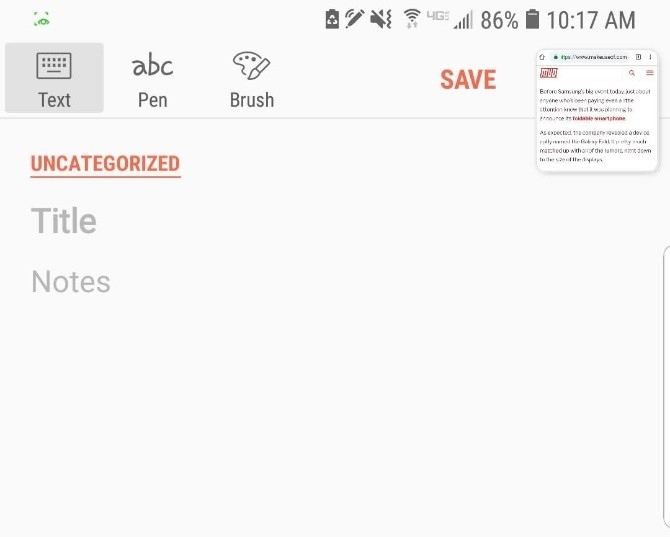 To revisit the minimized app, hover over it with your S Pen. When you’re done, move your S Pen away from the screen to return to the other app. Wondering how to get rid of the minimized screen? Use your S Pen to drag it to the trash can at the top of the screen. You’re surfing the web and come across an interesting picture. No matter how much research you do, you just can’t figure out what it is. However, with Bixby Vision, you can identify almost anything. If you didn’t already know, Bixby is like Samsung’s version of Google Assistant. After you add Bixby Vision to your Air Command menu, you can conveniently open it with your S Pen. To identify a picture, hover over it with your Pen. Bixby will automatically select the image and provide you with several ways to get more information about it. Choose to show shopping results, find similar images, extract text (if there is any), and even scan a QR code. Some websites aren’t optimized for mobile, making the text unbearably small and unreadable. Since Samsung developers thought of (almost) everything when it comes to the Note 9, they decided to include a built-in zoom tool. Add the magnifier app to your Air Command menu, and your S Pen will function as a virtual magnifying glass. Just hover your S Pen over a text or image to enlarge it. After a long day on the job, you’ll try anything to relieve yourself of work stress. Coloring books are a popular way to relax, and you don’t even have to pay to get one. Install the Coloring app on your Air Command menu, and you can choose from a variety of pictures to color with your S Pen. Pick your brush type, adjust your color sets, and you’re on your way to creating a work of art! Now that you’re aware of your S Pen’s versatility, you (hopefully) won’t use it only for note-taking. It’s time to show off these tricks to your friends, and make them wish they had a Note 9. Are you looking for ways to make using your phone even more efficient? Check out some helpful Android widgets that you should add to your home screen.